At the award-winning Dash and Bella, named after her son (7) and daughter (12), Sunset guest blogger Phyllis Grant tells stories about the intersection of cooking and parenting. For more, see Part 1. I yell a lot in the kitchen. Nice job flipping the pancakes! Leave the kitchen for five minutes and don’t come back until you can be safe. Your tart is so beautiful! I’m happy to say that after twelve years of navigating the kitchen with two kids, making a meal has become less of a wild event and more of a daily ritual: like brushing your teeth or making your bed. But my kids participate in very different ways. My seven-year-old son will speedily surf through the kitchen on his way to his homework, entering tasks midstream, snacking on parmesan, chopping the parsley, bashing garlic and anchovies with the mortar and pestle, spinning the salad greens, and then whoosh, he is gone and I’m on my own again. My daughter was born meticulous. She’s only twelve, but I pay her lots of cash to help me organize the toiletries, the pantry, my clothes. And in the kitchen, I call her the queen of mise-en-place. When she makes chocolate chip cookies, even before turning on the mixer, she must have everything measured out and arranged in pretty bowls. My kids are comfortable in the kitchen and able to be themselves because the rules are clear and we all feel safe. But in order to get to this place of ease, we have spent hundreds of hours chopping, whisking, rolling, stirring, baking, dish-washing, dish-breaking. If you can, start when they’re young. Assign small tasks. And never let cooking feel like a chore. 1. When they’re toddlers, place them on your hip or your back (I used an Ergo and then a hiking backpack) at the stove so that they feel like they’re a part of the experience. 2. Let them hold your wrist while you whisk, flip, or stir. 3. Hand little ones a butter knife and a soft piece of fruit like a peach or a pear. 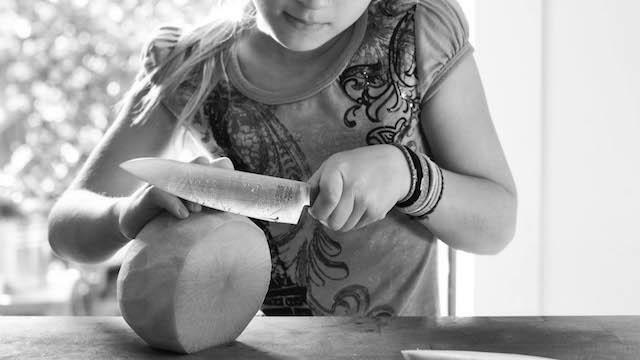 Next, still with a dull butter knife, teach them to curl their fingers and angle the knife away. Once they’ve mastered this technique, bring out the real knives. Just don’t look away for the first few years. 4. Hand them scraps of dough to make mini tarts. Let them over-mix and over-fill. 5. Don’t force your kids into the kitchen. Let them see you enjoying it (fake it if you need to). In fact, sometimes, don’t invite them into the kitchen at all. Let it be your peaceful place. Then watch them get intrigued. 6. There will be waste. Things will get broken. Fingers will get cut. Eggs will hit the floor. 7. Let go. Clean up. Start again. Play.